Eagle PSR is frustrayed with Wake County Transportation after late drop-offs and pick-ups. RALEIGH (WTVD) -- A Raleigh rehabilitation center is frustrated with Wake County's Coordinated Transportation Services. The center said the county is putting their clients at risk. Eagle PSR is a Medicaid sponsored service designed to help adults with psychiatric disabilities and increase their functioning levels. Matthew Forte, an employee at the center, said Wake County is dropping off their clients too late for appointments or picking the clients up much later than the 3:30 p.m. pick-up time. "The major problem is just clients not getting picked up on time, generally getting picked up two, three hours after their scheduled pickup time," he said. Wake County Coordinated Transportation services is free to Medicaid clients and it takes the clients to and from their appointments. Forte said his clients often have to wait hours for their rides to arrive and sometimes he has to take them home himself. 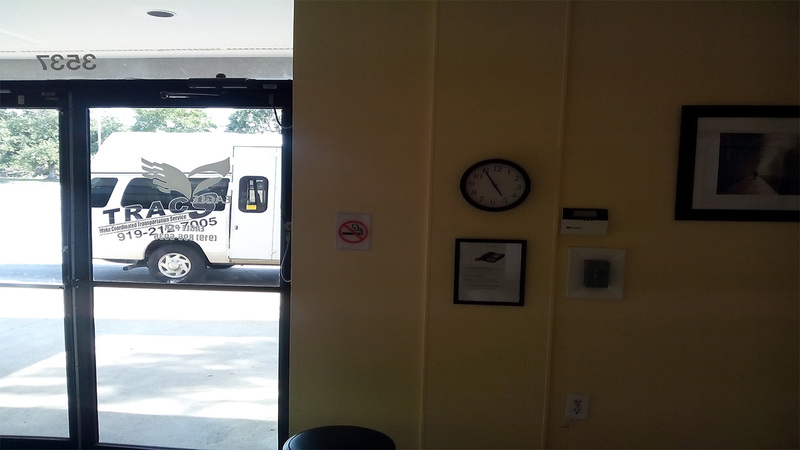 Forte shared this recent picture with me showing it wasn't until almost 5:00 p.m. when Wake County's van came for a 3:30 pick-up time. According to Forte, it's been a problem for more than a year. "That's a big issue and I just don't feel like it's being taken care of," he said. He said he's filed several complaints with Wake County and is always told that they're working on it. Still, Forte said every day at 3:30, he starts calling Wake County's dispatch center to find out when he can expect his clients to get picked up. "I've made hundreds of complaints, you know, regarding the issues," he said. "Some of these clients we have are 70 years old and plus. You know, with diabetes or dialysis, you know a lot of different medical issues so it's a concern." He said if the clients are left waiting at the center for too long, they may not be able to take their medications on time. "When it's hours past their time when they're supposed to be home and doing those things, but they're not because they're sitting in here. It's an issue," he said. On their end, Forte said Eagle PSR has done all they can to help with the situation. "We brought in more staff, had them come in earlier then also had another staff that will stand by me in the evening," he said. "We even got another van. Like we bought two vans, so just in case I have to take a group home and he has to take a group home we can do it." Annemarie Maiorano with Wake County said their transportation services may be inconvenient but their responsibility is to get clients to and from their appointments. "People might arrive early for their appointment and people might have to wait for a period of time after their appointment, but they have got their service," she said. "They have gotten to their appointment on time for their service," she said. Maiorano said that the county transports about 350 people a day and covers 857 square miles. She also said there is an hour window to get clients to and from their appointments within Raleigh and a one-and-a-half hour window if the clients have to travel outside the city. She said it's a problem if the clients are waiting longer than that for their rides. "Certainly if it's taking them more than two hours, which is beyond our acceptable window, we've got to add to our efficiency," she said. Maiorano thanked us for bringing the problem to her attention. After I started asking questions, Wake County did reach out to Eagle PSR and the two are meeting this week to see if they can resolve the issues. For Forte, it's all about serving their clients. "I feel like somebody has to be there to speak up for the people because they complain to me all the time," he said. We will keep you updated on what the county and Eagle PSR discuss. The two are hopeful a resolution can be reached.